The Ember Oaks Drain is located in Ingham County, MI at the downstream property line of the Ember Oaks Subdivision. Runoff from the Drain originally flowed to the Red Cedar River, and then overland through two natural drainage courses within the Red Cedar Glen Land Preserve. 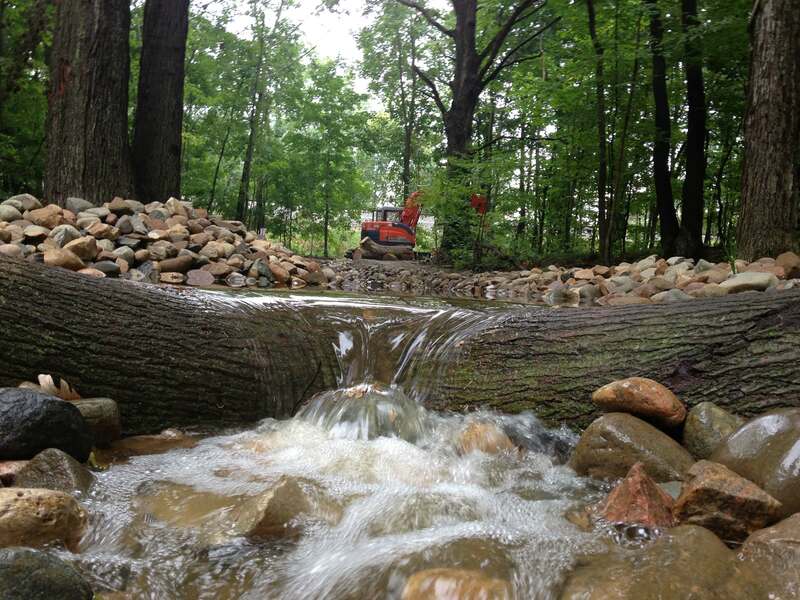 The Ingham County Road Commission decided to add lands to the original Drainage District to improve road drainage, and serve existing and future subdivision developments, a project that uncovered severe erosion along the two natural drainage courses within the Land Preserve. Steep banks, fallen trees, and severe erosion made for an unsafe environment for local residents, unstable habitat for plants and wildlife, as well as a deteriorating outlet for the Ember Oaks Drain. One of the main project goals was to enhance and improve the quality of the water discharged from the upstream subdivision before it flowed to the Red Cedar River. AEW’s design included constructing a series of aesthetic grade control stilling basins to absorb the energy of the water and progressively convey flows down the 12 foot drop across the Land Preserve to the Red Cedar River. The stilling basins subsequently created splash pads that add oxygen to the water, and create new and more diverse habitats for wildlife. Designing a solution that used natural, native and durable materials and techniques was important to achieve both objectives of environmental enhancement and sustainability, while also maintaining the integrity of the Land Preserve. including a series of log and fieldstone stilling basins, fieldstone riffles, fieldstone riprap, and log revetments. The project also included construction of two new timber boardwalks to accommodate pedestrian traffic over the drains. The final Ember Oaks Drain Improvements project cost was $895,000. Preserve, including water quality, sustainability, and more. AEW received an Innovation and Excellence Award from the Michigan Association of County Drain Commissioners (MACDC) in 2014 for our work on this project.